Take your street food game to the next level (a.k.a. over the top) with these loaded hot dogs. Bacon-wrapped dogs are pan-fried then baked for a crispy-outside finish. They’re served in classic hot dog buns with cheesy waffle fries stuffed right in the bun. Add a generous mix of toppings—say, relish, ketchup, mustard, jalapeños, Sriracha, beans and guacamole—and call it a win. Heat oil in skillet. Wrap bacon around each hot dog using half a toothpick to keep it together and tightly wrapped. Over medium/high heat in skillet, pan fry the bacon-wrapped hot dogs on all sides, until the bacon is crispy. Finish cooking burger in the 400 F oven, so it cooks completely through. Place bacon-wrapped hot dogs inside buns and add waffle fries between each bun and hot dog on both sides. Cover with lots of cheese. Place the hot dogs back into oven for a moment until the cheese is melty. 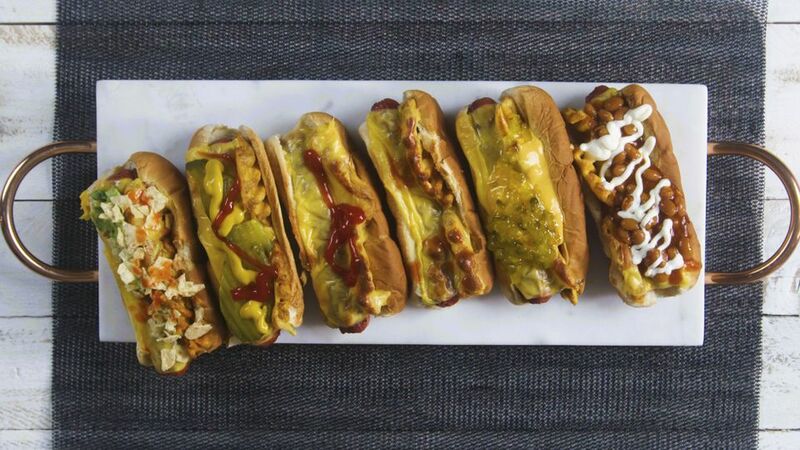 Serve hot dogs along with your favorite toppings. We suggest: jalapeno, crushed potato chips, mayo, relish, sriracha, hot sauce, sour cream, guacamole, baked beans.